There are three main types of plate boundary. These are convergent (destructive), divergent (constructive) and conservative. The direction of plate movement dictates the features and processes associated with each tectonic plate boundary. Where oceanic and continental plates meet the oceanic crust sinks, or subducts, below the less dense and lighter continental crust. Subduction leads to the formation of an ocean trench. These trenches can be up to 11,000m deep. They mark the point where the oceanic plate enters the asthenosphere. As it does this the continental crust buckles forming the trench. As an oceanic plate converges on a continental plate the sedimentary rock formed on top of the ocean crust folds upwards along the leading edge of the continental plate. In addition to this, the continental crust also lifts and buckles and magma is injected from the asthenosphere. This process forms fold mountains of which the Andes and the Rockies are examples. As the oceanic crust subducts the continental crust it melts. The magma rises as it is less dense than the material around it. Large intrusions of magma create uplift, further contributing to the formation of fold mountains. Volcanoes are formed where magma reaches the surface of the Earth. Where two oceanic plates converge the denser crust subducts the other. This creates a trench. As the oceanic plate descends it melts, and the magma rises forming a volcanic island chain, known as an island arc. The north-west Pacific Ring of Fire has a series of island arcs including the Aleutian Islands. 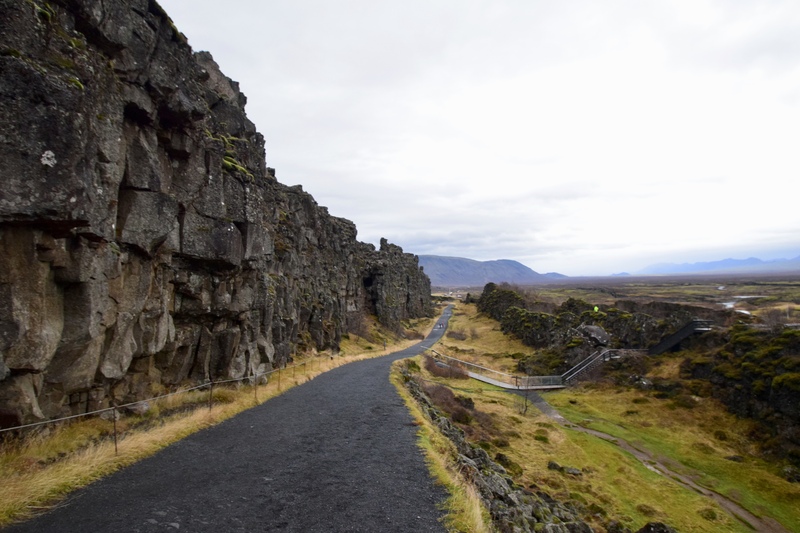 Where two continental plates meet there is typically no subduction. Fold mountains, such as the Alps and the Himalayas form. Constructive plate margins involve two plates moving away from each other. Where this occurs magma rises through the asthenosphere to the surface of the Earth. This typically occurs along a mid-oceanic ridge, such as the mid-Atlantic rift that extends from the north to the south of the Atlantic ocean. Long chains of mountains form along these ridges. Due to the varying amount and rate of magma released mid-oceanic ridges vary in shape. Eruptions along constructive plate margins mainly occur underwater. Pillow lavas are formed as lava is rapidly cooled on the sea floor. In the North Atlantic the extrusion of magma has been so great it created the largest volcanic island in the world, Iceland. As magma rises the rocks above often form a dome. The lithosphere is put under great stress and eventually fractures along faults. This forms the underwater rift valleys found along mid-oceanic ridges. Rift zones also occur on land and help explain how continents break up. The continental crust must be thin for rifting to happen. One of the best examples is Iceland’s rift valley, þingvellir. This is where the North American Plate and the Eurasian plate are separating. A graben or sunken valley has been formed where the crust has been stretched, causing faulting. At conservative plate margins, tectonic plates slide past each other. There is no volcanic activity associated with conservative plates, though earthquakes can often occur. This is because plates do not pass each other smoothly; friction causes resistance. As pressure builds the crust can fracture releasing energy as earthquakes. It is possible to see the boundary between plates along a conservative margin. An example of this is the San Andreas fault in California. This is where the North American and Pacific plates slide past each other.